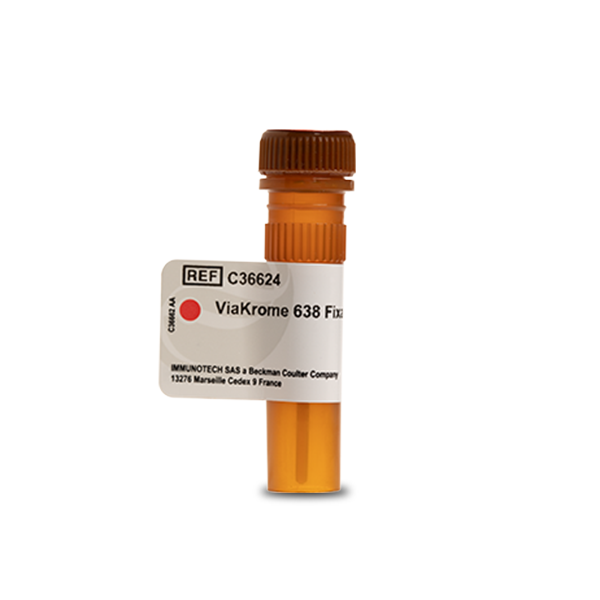 The ViaKrome 638 Fixable Viability Dye is a thiol reactive fluorescent dye that covalently binds free thiol present on cellular proteins at a neutral pH. Live cells, impermeable to the ViaKrome 638 Fixable Viability Dye, will be weakly stained by the covalent binding of proteins expressed on the cell surface while cells whose membranes have lost structural integrity will be strongly stained by the covalent binding of intracellular and membrane expressed proteins. The reactive groups are stable in aqueous solutions, thus the ViaKrome 638 Fixable Viability Dye does not require DMSO for reconstitution.